This is one of the classic Sierra mountaineering routes. It can be a snow slog in the spring, a heroic nieve dream in Aug, or a sweet alpine ice route in the fall. 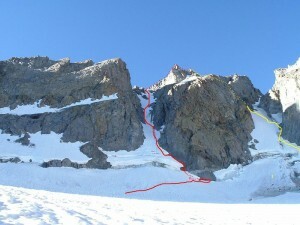 Climb it early in the day when the snow/ice is firm and loose rock flying down the couloir is at a minimum. Late day has debris randomly shooting at you. This is a classic route in a very unique way considering that you are climbing in the Sierra Nevada which has few real ice/snow routes that stick around all summer and fall. Climb it before the earth warms up too much and it becomes a nasty gully, I give it 30 years max. V Notch in red, descent in yello.